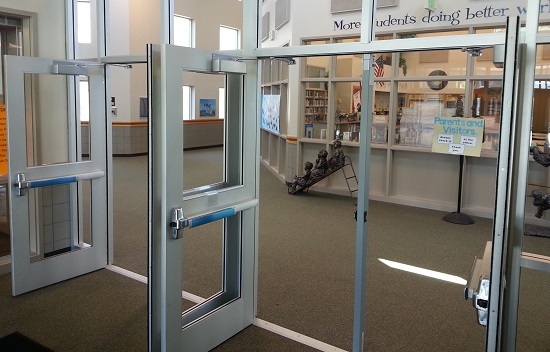 Rim exit devices are a type of panic device that is used on out-swinging doors. This exit device hardware can have trim or levers on the other side of the door. They can be labeled as fire rated or just labeled as panic hardware. 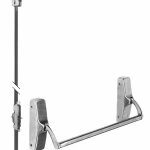 Rim exit devices can be used on single doors as well as double doors. 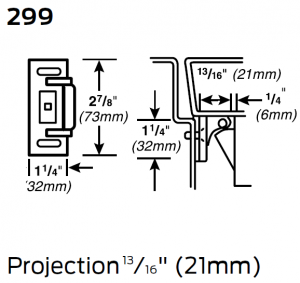 In this blog post we will take a look at some of the basics of rim exit devices. 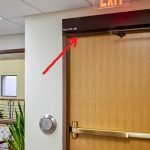 What makes a rim exit device unique among exit device types? The main thing is the latch is unique on a rim exit device. The exit device push bar has the latch protruding out of one end of the device itself. Other latch types are connected to the device but the rim latch is built in as part of the actual push bar mechanism. 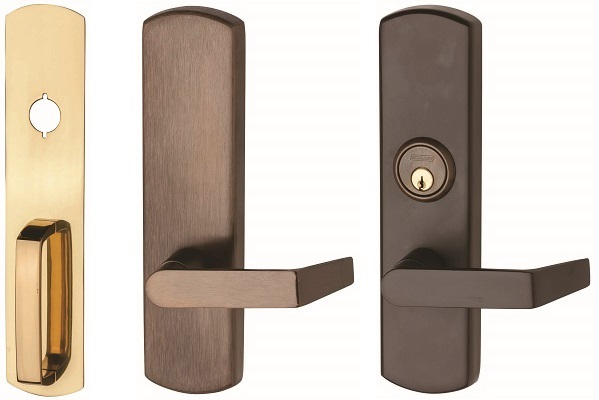 Other latch types include mortise locks and vertical rods or vertical cables. These other latches are separate pieces of auxiliary hardware that ties into the push bar. 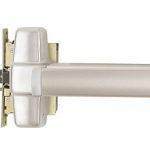 The rim latch is very secure and lasts a long time when installed correctly. The strike for a rim exit device is installed to the soffit of the strike jamb on the door frame. Most other latching hardware has a strike that is cut into the rabbet of the strike jamb. The latch will engage the strike as the door comes closed. No manual operation is required to ensure the door latches. A closer is always installed on doors with panic devices which means the door will close by itself and allow the latch of the rim exit device to engage the strike. 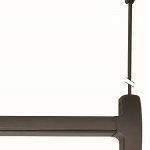 You can think of the soffit of the frame as the “rim” of the frame and the strike is installed to the “rim”, thus giving us the name of the “rim” exit device. Exit devices have a lot of the same outside trim options. However, cylinder requirements may differ between exit device types and manufacturers. Exit Only – No outside trim or blank outside plate. 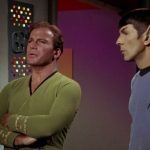 This function does not allow entry. 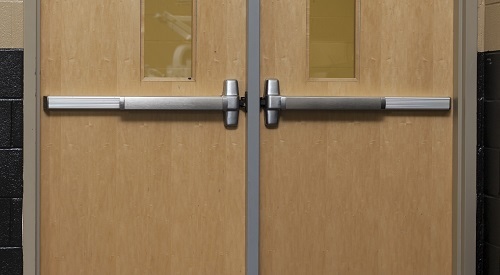 Classroom Function – Outside trim can be locked and unlocked with a key. 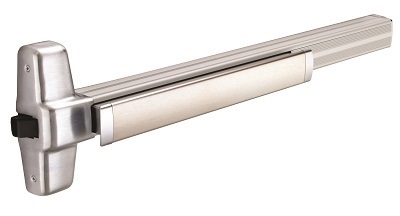 Passage Function – Outside trim is always operable for entry, no locking functionality. Storeroom Function – Outside trim is always locked and requires a key to retract latch for entry. Dummy Trim – Outside trim is rigid and always inoperable. Can be utilized as a pull handle when exit device is dogged. 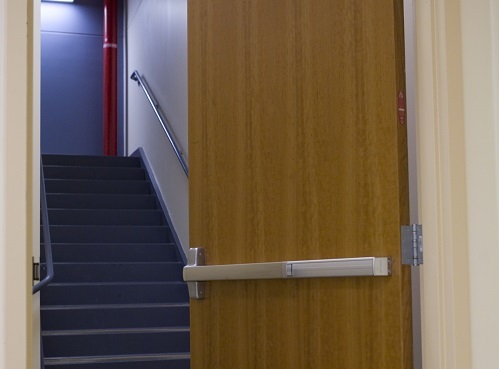 Rim exit devices are the most common type of panic hardware used on single doors. They are a simple application with the strike installed on the soffit of the strike jamb of the frame. The frame is reinforced for the strike and the door is prepped for the mounting of the device and hardware. A pair of door leafs can each have a rim exit device installed on it. The most secure and most popular way to install rim exit devices on double doors is to also install a mullion between the doors. This can be a fixed or a removable mullion. The strikes for each rim exit device will be installed on the mullion on either side.